Chagall was a Russian-Belarusian-French painter of Jewish origin, who was born in Belarus, at that time part of the Russian Empire. He is associated with the modern movements after Impressionism. Marc Chagall was born Moishe Shagal; his name was rendered in the Russian language as Mark Zakharovich Shagalov. Chagall was born in Liozno, near Vitebsk, Belarus, the eldest of nine children in the close-knit Jewish family led by his father Khatskl (Zakhar) Shagal, a herring merchant, and his mother, Feige-Ite. This period of his life, described as happy though impoverished, appears in references throughout Chagall's work. Currently the Shagal's house on Pokrovskaya Street in Vitebsk is restored as part of the Marc Chagall's Museum. After he began studying painting in 1906 under famed local artist Yehuda Pen, Chagall moved to St. Petersburg some months later, in 1907. There he joined the school of the "Society of Art Supporters" and studied under Nikolai Roerich, encountering artists of every school and style. From 1908-1910, Chagall studied under Leon Bakst at the Zvantseva School of Drawing and Painting. This was a difficult period for Chagall; at the time, Jewish residents were only allowed to live in St. Petersburg with a permit, and the artist was jailed for a brief period for an infringement of this restriction. Despite this, Chagall remained in St. Petersburg until 1910, and regularly visited his home town where, in 1909, he met his future wife, Bella Rosenfeld. After gaining a reputation as an artist, Chagall left St. Petersburg to settle in Paris to be near the burgeoning art community in the Montparnasse district, where he developed friendships with such avant-garde luminaries as Guillaume Apollinaire, Robert Delaunay, and Fernand Léger. In 1914, he returned to Vitebsk and, a year later, married his fiancée, Bella. While in Russia, World War I erupted and, in 1916, the Chagalls had their first child, a daughter they named Ida. Chagall became an active participant in the Russian Revolution of 1917. Although the Soviet Ministry of Culture made him a Commissar of Art for the Vitebsk region, where he founded Vitebsk Museum of Modern Art and an art school, he did not fare well politically under the Soviet system. He and his wife moved to Moscow in 1920 and then back to Paris three years later, in 1923. During this period, Chagall published his memoirs in Yiddish, which were originally written in Russian and translated into French by Bella. He also wrote articles, poetry and memoirs in Yiddish, published mainly in newspapers (and only posthumously in book-form). Chagall became a French citizen in 1937. With the Nazi occupation of France during World War II and the deportation of Jews, the Chagalls fled Paris, seeking asylum at Villa Air-Bel in Marseille, where the American journalist Varian Fry assisted in their escape from France through Spain and Portugal. In 1941, the Chagalls settled in the United States of America. On September 2, 1944, Chagall's beloved Bella, the constant subject of his paintings and companion of his life, died from an illness. Two years later, in 1946, he returned to Europe. By 1949 he was working in Provence, in the South of France. That same year, Chagall took part in the creation of the MRAP anti-racist NGO. The depression Chagall experienced following Bella's death was alleviated when he met Virginia Haggard, with whom he had a son, David (McNeil). At this time, Chagall received financial aid from theatrical commissions and, in his painting, rediscovered a free and vibrant use of color. His works of this period are dedicated to love and the joy of life, with curved, sinuous figures. He also began to work in sculpture, ceramics, and stained glass. In 1950 he also began experimenting with graphic mediums. After meeting with Fernand Mourlot, he often visited Mourlot Studios where he eventually produced close to a thousand different lithographic editions. With the assistance of Charles Sorlier, a master printer working at Mourlot, he spent 30 years exploring the graphic medium that most lends itself to color representation. Charles Sorlier also became one of his closest friends, assistant and counsel until the day of his death. Chagall remarried in 1952 to Valentina Brodsky (whom he called "Vava"). He traveled several times to Greece and in 1957 visited Israel. In 1960, he created stained glass windows for the synagogue of the Hadassah Ein Kerem hospital in Jerusalem and, in 1966, wall art for the new parliament being constructed in that city. During the Six Day War the hospital came under severe attack, placing Chagall's work under threat. In response to this, Chagall wrote a letter from France stating: "I am not worried about the windows, only about the safety of Israel. Let Israel be safe and I will make you lovelier windows." Luckily, most of the panels were removed in time, with only one sustaining severe damage. In 1973, Israel issued a series of stamps featuring the Chagall windows, which depict Twelve tribes, such as Levi, pictured here. 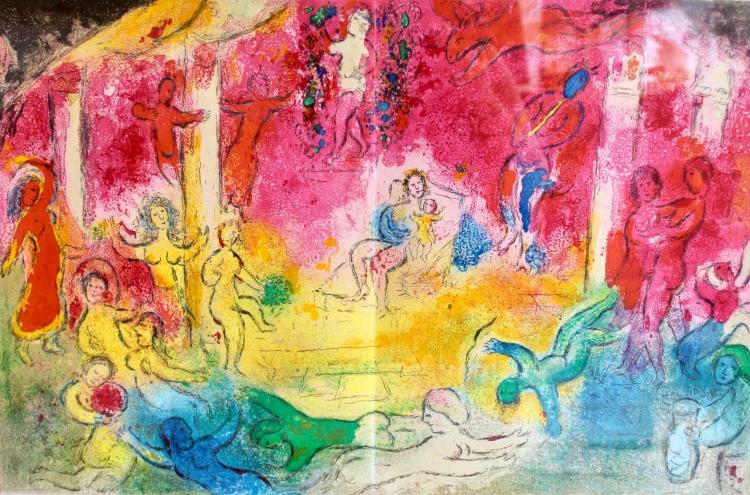 At the age of 97, Chagall died in Saint-Paul de Vence on the French Riviera on March 28, 1985 and was buried at the local cemetery.